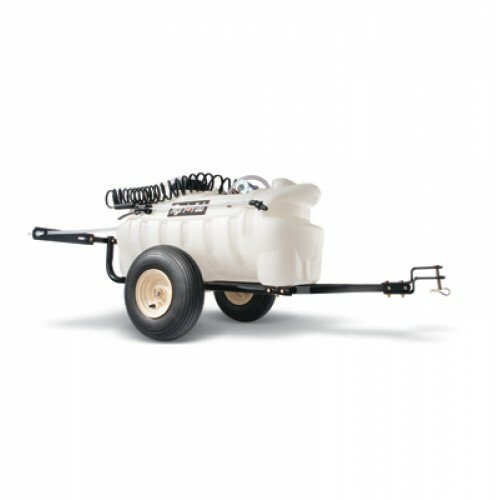 From spot weed control to large area fertilization, our complete line of sprayers offers the efficiency, capacity and safety you need for just about any spraying job. All have easy -to-grip handgun hoses for efficient operation and complete control in liquid spray direction. You can quickly apply herbicide, insecticides and other lawn products on turf, trees and scrubs. It's faster because a tow behind gives you five times the capacity of the smaller hand held sprayers. It's easier because you simply connect the wiring to your tractor or ATV battery, turn it on and spray away. When you tow behind, you save a ton of time (and a lot of effort). Agri-Fab tow-behind sprayers are so much easier than ordinary hand-held models. You can quickly apply herbicide, insecticides and other lawn products on turf, trees and shrubs. It’s faster because a tow-behind gives you five times the capacity of the smaller hand-held sprayers. It’s easier because you simply connect the wiring to your tractor battery, turn it on and spray away. Agri-Fab sprayers have plenty of added-value features to make set-up simple, use easy and longevity assured.